WASHINGTON (MarketWatch) — Private-sector hiring in November was the hottest in a year, as 215,000 jobs were added, according to a report from Automatic Data Processing released Wednesday morning. The result blew past the consensus economist forecast, which had expected a November result of 178,000 new private jobs, up from an originally estimated gain of 130,000 in October, when the government shutdown hit the labor market. On Wednesday, ADP revised October’s gain to 184,000. “The job market remained surprisingly resilient to the government shutdown and brinkmanship over the Treasury debt limit. Employers across all industries and company sizes looked through the political battle in Washington. If anything, job growth appears to be picking up,” said Mark Zandi, chief economist of Moody’s Analytics, which prepares the report with ADP’s data. Not everyone's sold on the gains in a key manufacturing survey. Economists use ADP’s data to get a feeling for the official U.S. Labor Department’s employment report, which will be released Friday and which includes government jobs in addition to the private sector. Economists polled by MarketWatch expect the government’s report to show that nonfarm employment rose by 180,000 jobs in November, compared with an increase of 204,000 in October. Markets are searching the jobs data this week for clues about when the Federal Reserve will deem the economy healthy enough to start paring its massive asset-purchase program, which officials crafted to stimulate growth by keeping downward pressure on long-term interest rates. Recent data are increasing pressure on the Fed to taper, economists said Wednesday. “The ADP data is the latest piece of strong data, telling the Fed what they already know, that they should have pulled the trigger in September,” Richard Gilhooly, U.S. director of interest rate strategy at TD Securities, wrote in a research note. In one piece of good economic news, manufacturing posted surprisingly strong growth in November, according to a recently released gauge. However, recent polls signal that most economists and investors expect that the Fed’s tapering won’t start until next year. The economy has added jobs every month for more than three years, but still has 1.5 million fewer jobs than when the recession began at the end of 2007. Still, recent trends show a pick up. Over the quarter that ended in October, nonfarm employment rose by an average of 202,000 jobs per month, up from an average of 154,000 jobs during the same period in the prior year. 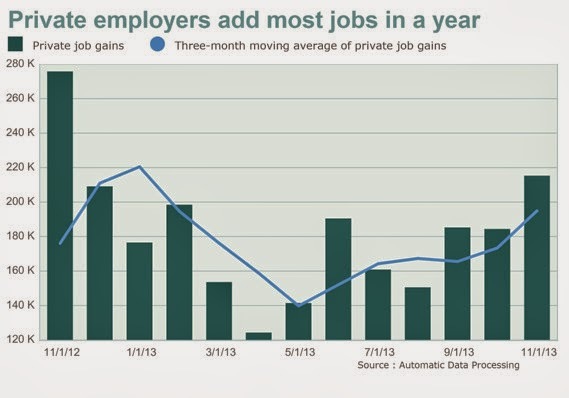 ADP’s report showed a similar trend for private jobs. Over the three months that ended in November, the private sector added an average of 195,000 jobs per month, up from an average of 176,000 during the same period in the prior year. ”The bigger-picture message is that the economy has successfully shaken off the shutdown and debt-limit saga and, if anything, is gaining momentum,” said Jim O’Sullivan, chief U.S. economist at High Frequency Economics. Details of ADP’s private-jobs report show that service providers added 176,000 jobs in November, the most in a year, while goods producers added 40,000 jobs, the most since December. Small businesses added 102,000 private jobs, while large businesses added 65,000, and medium businesses added 48,000.